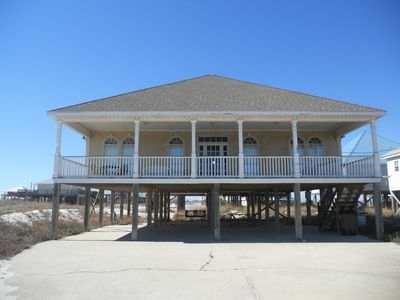 This 3-bedroom, 2-bath waterfront house is most loved for its location and convenience. 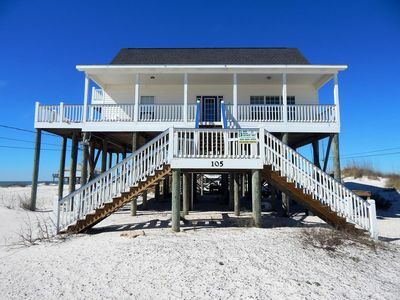 Situated on little Lafitte Bay at the west end of Dauphin Island, this family-friendly house can offer you the best of both worlds while on a beach access to water sports right outside your door as well as sand and surf just just two blocks away! 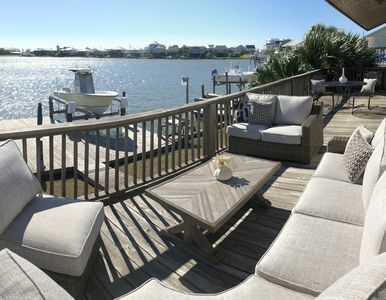 Lafitte Bay is a small inland bay completely surrounded with a boardwalk-covered seawall; its calm waters and no-wake zone allow for the best paddle boarding and kayaking on the island! 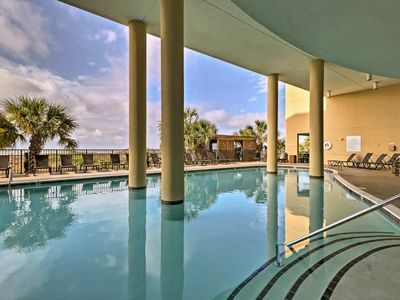 The Gulf-side beach is just two blocks away though so if you want a beach day, just load up the wagon with the beach chairs we have provided and head on over! 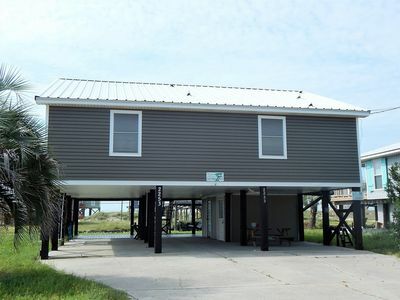 For the fisherman, Lafitte bay has easy boat access to the Mississippi Sound and is just a few minutes from the closest boat ramp and marina. If you own your own boat, feel free to tie it off from our dock. 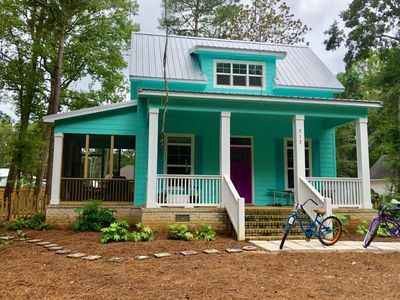 The house is also about a 1/2 mile from the local pizza and sno-cone hang out so your family can walk to dinner and your teenagers are sure to make a few friends. 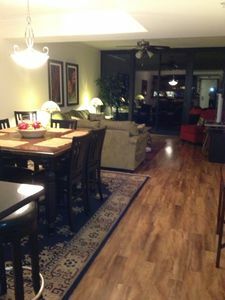 The spacious and airy house offers an open floor plan with glass front double doors leading to an upper deck. 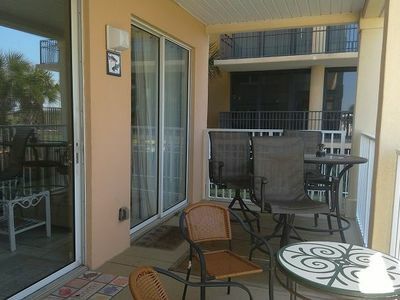 The deck has comfortable sofas and chairs as well as outdoor dining table. 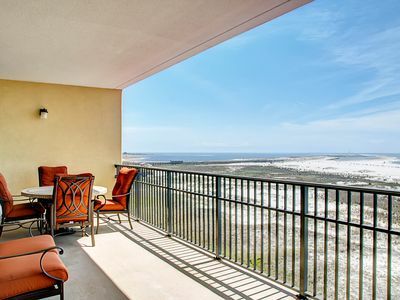 Lots of windows bring in plenty of natural light and beautiful views of the bay, the sound, and the Gulf. The kitchen and adjoining dining area overlook the family room. The dining table has seating for 8; or if you want to eat outside on the upper deck, there is a table that seats another 5 people. There is a charcoal grill under the house and a grassy lawn for the kids to enjoy a picnic. 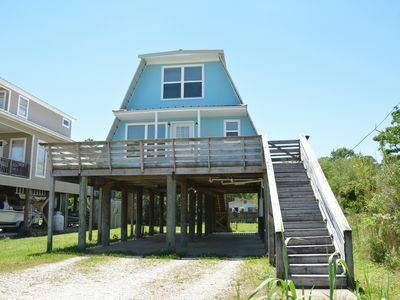 The house faces west with the dock and upper deck on its east side, so you won't get baked by the afternoon sun. The swing and hammock under the house are nice for afternoon naps. There is a picnic table under the house also. The dock is well equipped with a swim ladder, umbrella, fishing lights and a well-lit fish-cleaning sink. Lafitte Bay is a nice place to explore with the kids. A seawall surrounds the bay and passes in front of every house forming a nice walkway. There is a cute little beach on Lafitte bay with tons of hermit crabs for the kids to enjoy and the kayakers to rest. There is also a butterfly garden that is very active several times a year since Dauphin Island is on the migration route for the Monarch butterfly. Your teenagers will enjoy hanging out at the pizza place which is just a few blocks away. There are four restaurants, a sno-cone place, and an ice cream shop within walking distance (less than a 1/2 mile). 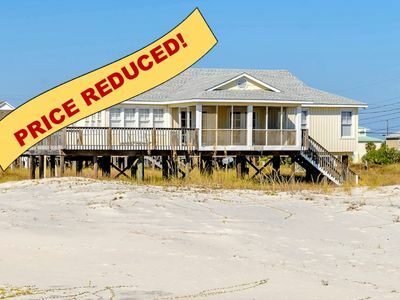 This wonderful retreat has it all! 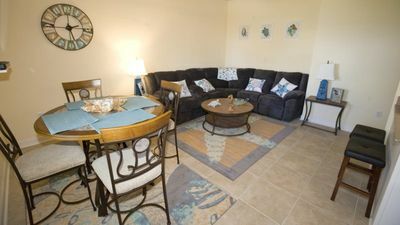 Other amenities include four kayaks and one paddle board, an outdoor shower, a swing, a hammock, charcoal grill, basic cable tv and free wifi. 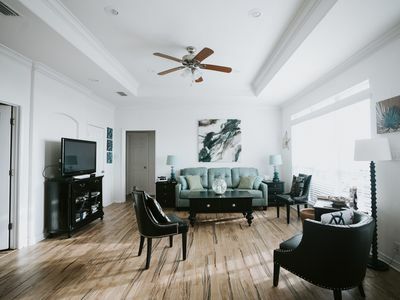 The living area has a large sectional (that can be used for overflow sleeping.) A TV is also located in this room and can be seen from the kitchen. 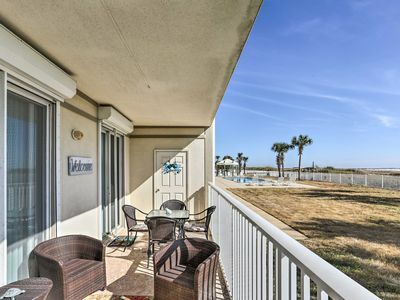 The double glass doors open right out onto the upper deck overlooking the dock and Lafitte Bay. There are no stairs from the upper deck in case you are worried about little ones making a fast break for the water. 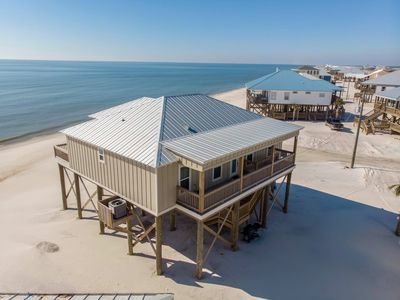 This little retreat has something for everyone and is perfect for families, fishermen, and just friends getting together! 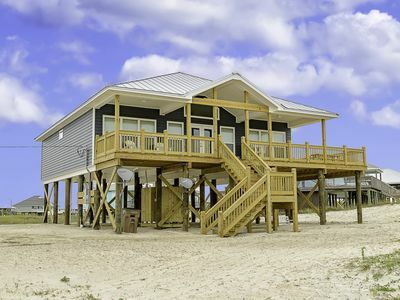 Dauphin Island has so much to do! Besides its wonderful beaches you can rent a pontoon boat and explore the island and pull up to a local restaurant for lunch. You can hire a fishing charter and go deep sea fishing or inland fishing. You can go to the Sea Lab and learn all about the local estuary and sea life. You can even pet the sting rays! 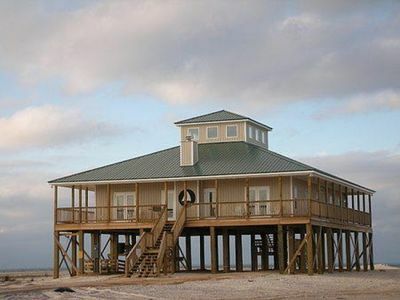 Dauphin Island is one of the top birding spots in the world! Visit the Audobon Bird Sanctuary, a national park, and walk along their boardwalk that is well marked for local wildlife and birds. Spend a day at the Isle Dauphine Club swimming in the public pool, playing golf or tennis, walking on their private secluded beach, or dining in one of their restaurants. Explore Ft. Gaines, a restored Navy fort that dates back to colonial days and was instrumental in the Battle of Mobile Bay. 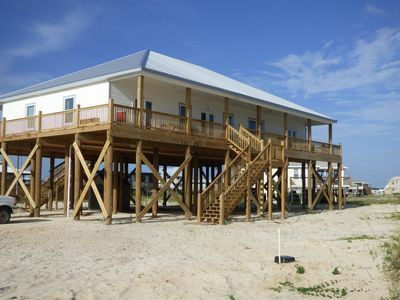 Or rent bicycles and bike the entire length of Dauphin Island on the seven mile bike trail. Visit the Lighthouse Bakery for some homemade, baked daily, cinnamon rolls or muffins. Pick up freshly caught fish at Skinners Seafood Market and throw it on your grill or have them steam fresh shrimp with corn and potatoes to take back to the house. You will enjoy lots of quality time at Quality Time! 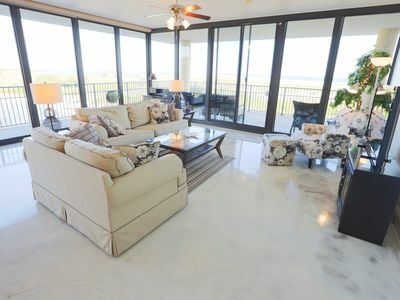 "The Easy Way" | Screened-In Porch | Cozy Living Area | Fantastic Views! 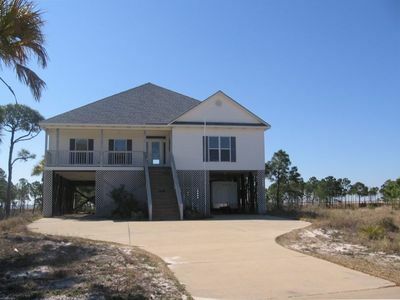 Beautiful Gulf View House the Island, family friendly and steps from the Gulf. 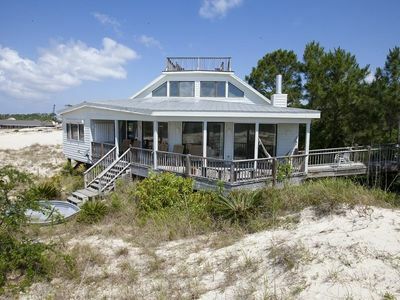 SEA VIEW Cottage: Private, beautiful, fully equipped, and owner-managed!